I am busy because I am vain. I want to appear important. Significant. What better way than to be busy? The incredible hours, the crowded schedule, and the heavy demands on my time are proof to myself – and to all who will notice – that I am important. There is no question leading or planting a church is to embrace a whirlwind of people, events, and countless other things demanding your time. It’s inevitable. In my own world, especially in the early years, my week was full of counseling congregants, meetings with ministry teams, lunch dates with members, setting up chairs in the school where we were meeting, not to mention finding time for sermon prep. Busyness not only was a given but I started to make it my normal, and not just externally but internally as well. I thought a sign of health and growth as a pastor was to live life going a 1,000 miles an hour. I believed it communicated I was on the right track, making progress, and honoring God with every second. What I didn’t realize is that if pastors aren’t careful, doing the work of Jesus in the church can kill the work of Jesus in them. When life is a blur of activity with little to no reflection and quiet with Christ the soul withers. We start listening to every voice but the One which ultimately matters. Leadership and ministry books are read by the dozens while the Scriptures are only opened for preparing messages. We begin to talk a lot about God to others but seldom make time for him to talk to us. I know I’ve been guilty of living this way. There is a reason why God says in Psalm 46:10, “Be still and know that I am God.” The context finds Israel in the midst of perilous times, experiencing conflict from the nations around them. Surely it was a hurried, anxious, frenetic season. Yet, in the midst of all this craziness, God calls his people to slow down, stop striving, be still, and reflect on the truth of who he is! What is true is for Elijah often is true for us: God speaks not in the roar but the whisper. And if we think a hurried, anxious, frenetic life in ministry is healthy, we’ve likely succumbed to the temptation of busyness. It only appears we’re getting things done while our interior life greatly suffers. As Eugene Peterson notes, busyness gives the appearance of significance. Frankly, a bursting-at-the-seams calendar may indicate poor stewardship of our friends, our family, and even our faith. Always being busy strands us in the desert waste where God’s voice is hard to hear. 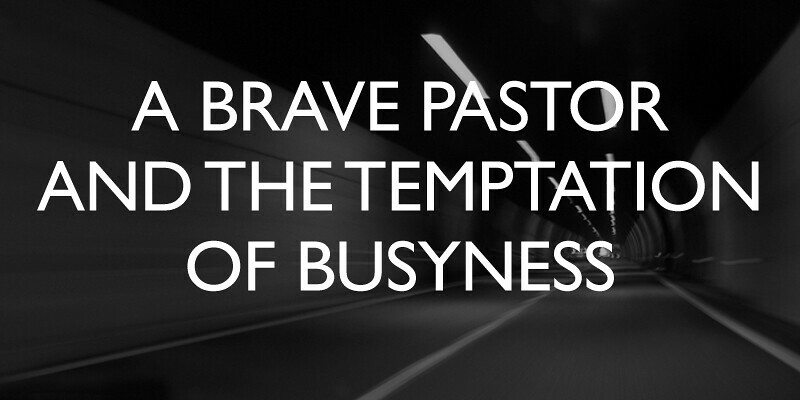 That’s why brave pastors fight the temptation of busyness by embracing slowness. Jesus did. After a long day of ministry Jesus grabbed his disciples and told them in Mk. 6:31, “Come away by yourselves to a secluded place and rest a while.” Jesus knew the value of taking a detour and finding a quiet place in the middle of the hubbub of ministry. He and his disciples were running around doing all kinds of great things for the kingdom and Jesus said, “Let’s get out of here!” He didn’t do this for his followers but himself as well. Luke 5:16 says, “Jesus often withdrew to lonely places and prayed.” Mark 1:35 adds another snapshot of Christ, saying, “Very early in the morning, while it was still dark, Jesus got up, left the house and went off to a solitary place, where he prayed.” If slowing down was good for the King of Glory then surely it must be good for those who follow that king. Be brave and decide to fight the temptation of busyness. Find a distraction-free zone where you can get alone and quiet on a regular basis. Cut down your time on media and open your Bible a bit more. Periodically not only take time off but time away as well. Pastors need places to go and rhythms to embrace where they can move from the voices to the Voice, from the thousand words to the one Word.